CrystalClear Clarity Max Plus is a patent pending formula that combines the natural degradative powers of barley with the powers of a strong bacteria colony, then we add several inert ingredients and 6 enzymes for a 3 in 1 product. CrystalClear Clarity Max Plus contains Activated Barley, a product that no other bacteria and enzyme company has CrystalClear Clarity Max Plus’ Activated Barley contains enough surface area to do the job of an entire bag of barley. No more messy barley bales or stinky bacteria products. CrystalClear Clarity Max Plus is the 3 in 1 product that does it all! 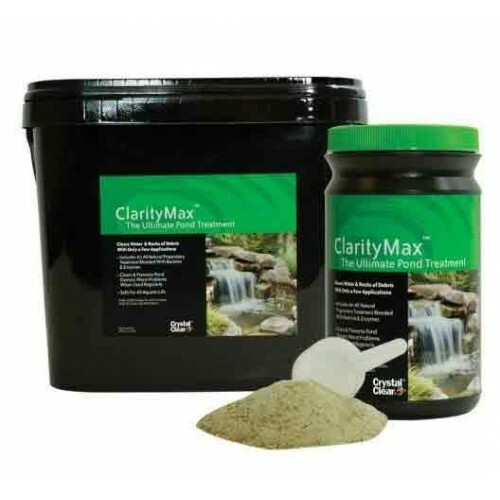 CrystalClear Clarity Max Plus was found to reduce excessive nutrient content that contributes to organic growth and helped to enhance existing filtration systems. CrystalClear Clarity Max Plus is a problem solver. Once the problem has been resolved it is best to routinely treat the pond with either CrystalClear Biological Clarifier (Dry or Liquid) or CrystalClear AmmoniaFix to maintain a good bacterial balance within the pond system. CrystalClear Clarity Max Plus will break down and reduce pond debris, thus making it easier to remove by pond filtration systems. It has been Winston’s field experience that the product works best in ponds from 500 - 8,000 gallons, however very good results have been recorded on much larger projects (16,000 - 500,000 gallon ponds). Apply CrystalClear Clarity Max Plus over the surface area or around the perimeter of the pond in dry form for best results. Be careful not to let the product dust plant coverage. Immediately after application the pond may become cloudy. This is a normal process and should clear within 24 - 48 hours. Algae growth should become noticeably reduced within 5 - 15 days’ time is application rates are followed.